The Summer 2014 Research Team (From Left): Top Row - Ashley Glenn, Lauren VanGelder, Shant Tamazian, Giselle Rodriguez, Emily Bakaj, Spiderman, Abelardo Arellano. Second Row - Dr. Tom Love, Dr. Doug Sharon, Katelyn Henson, Carolyn Gigot, Dr. Gail Willsky, Jessica Ortiz. Bottom Row - Kristen Brooks, Lauren Carnevale, Emily Frisch, Thom Cleland. Many professors, lab technicians, curanderos, doctors, botanists, non-profit workers, herbalists, institutionsm and students have helped make North Peru Projects possible. Co-founder of North Peru Projects, Dr. Douglas Sharon has led all anthropological research since its establishment in 2002 in cooperation with the project’s ethnobotanist Dr. Rainer Bussmann, and currently with biochemist Dr. Gail Willsky and anthropologist Dr. Thomas Love. Recently retired Director of the William L. Brown Center at the Missouri Botanical Garden and co-founder of North Peru Projects, Dr. Bussmann has led the ethnobotanical fieldwork and laboratory portions of the project since its establishment in 2002. He also manages other ethnobotanical projects in Amazonian Peru and in Bolivia, as well as in Madagascar, Nepal, and elsewhere in the world. He resides with his ethnobotanist wife in La Paz, Bolivia. Dr. Glass-Coffin is Associate Professor of Anthropology at Utah State University. 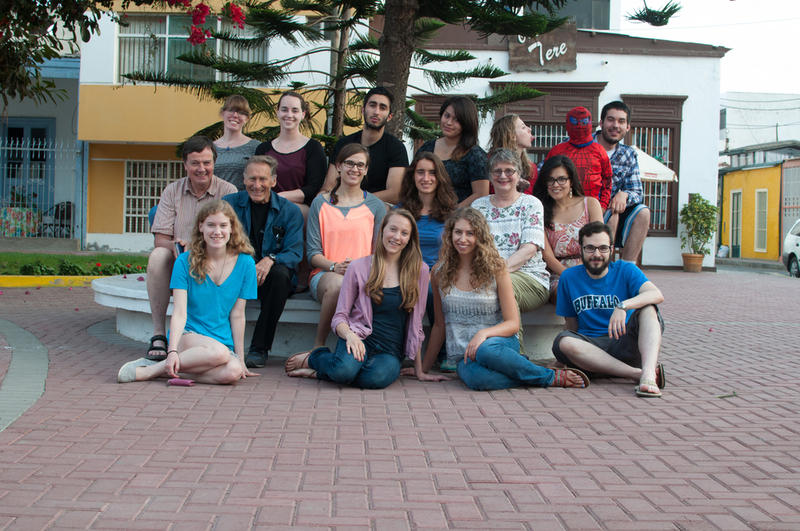 She has run several ethnographic field schools in Huanchaco, Peru, and cooperated with NPP since its beginning. She specializes in north coast Peruvian shamanism and gender studies, and is a board member of Healer of the Heart Foundation, a group devoted to the conservation of Peruvian shamanism. Biochemist and Associate Professor at the University at Buffalo (SUNY) School of Medicine and Biomedical Sciences. Dr. Willsky has been co-director of the MHIRT-Peru laboratory work since 2011 at the National University of Trujillo (UNT). She oversees students researching microbiology, toxicity screening, and phytochemistry of medicinal plants. Working with North Peru Projects since 2008, Dr. Love is currently Professor of Anthropology and Environmental Studies at Linfield College in McMinnville, Oregon. He is actively involved in several economic and environmental anthropology research projects in energy and sustainable development, in addition to supporting and mentoring students involved in NPP. Ashley Glenn is Director of the Sacred Seeds community garden program at the Missouri Botanical Garden. She has helped NPP lay the foundation for community medicinal plant and food gardens on the north coast and highlands of Peru. A medical anthropologist and Associate Professor at the University at Buffalo (SUNY), Dr. Bacigalupo has extensive fieldwork experience with Mapuche shamanism in Chile. She started working with NPP in 2012, and is currently training MHIRT-Peru students in shamanism, medical anthropology, and ethnographic fieldwork. A health services researcher and medical anthropologist at the University at Buffalo (SUNY) School of Medicine and Biomedical Sciences, Dr. Kahn has worked with NPP since 2012. She is currently training students in medical anthropology and qualitative methodology in preparation for NPP-affiliated fieldwork. June 2014 - NPP students, participating research leaders, and UNT students and faculty. gather to hear Drs. Gail Willsky and Douglas Sharon speak about the biochemical properties of native Peruvian plants and related shamanism. Curanderismo, or shamanism, is a form of Traditional Medicine that utilizes varied techniques and rituals including prayer, medicinal plants, divination, psychic healing, and the use of power objects. Curanderos' healing techniques can either be inherited from family members, acquired through apprenticeship, or, in many cases, curanderos can acquire healing powers spontaneously. Despite the varied ways through which they gain healing knowledge, all curanderos believe that their knowledge of healing comes from God and that they are mediums through which divine healing powers work. Healing through curanderismo involves religious rituals, both native and Catholic, and the use of mind-altering medicinal plants. Drinking a concentrated juice made from the San Pedro cactus, healers use key religious artifacts and aromatic herbal perfumes from their mesas ("tables," or altars, containing power objects used during the ceremonies) to heal patients' ailments. Peruvian Traditional Medicine has a wide array of specialties outside of curanderismo, including yerbateros (herbalists), parteras (midwives), and sobadores (massage/acupressure specialists), all of whom rely heavily on plant knowledge to treat various maladies. June 2014 - Julia Calderón de Avila chatting with her patients before a healing ceremony. UNT Faculty members with Drs. Gail Willsky and Douglas Sharon. Dr. Mayar Ganoza is third from the left. Ines Castro, B.S. UNT chemistry and pharmacology; current graduate student at Cayetano Heredia University in Lima. Gonzalo Malca, current chemical engineer and Ph.D. candidate at Leipzig University in Germany. Alejandro Piña Irtube, currently studying microbiology at UNT. June 2014 - Alejandro Irtube aids MHIRT student Abelardo Arellano the UNT lab. Dr. Dena Plemmons, Ph.D., Adjunct Professor of Medical Anthropology at SDSU. 2014 - Dr. Luis Fernandez discusses a possible plant supply chain from Huamachuco to the coast with Dr. Sharon and other Peruvian colleagues. Dr. Luis Fernandez, M.D., Medical Director of Centro de Attención Medicina Complementaria (CAMEC), Trujillo. Dr. Fernandez has been collaborating since 2012 with NPP on complementary medicine research. Dr. Martha Villar, M.D., National Director of PRONAMEN. Dr. Villar, pioneer of EsSalud's National Program in Complementary Medicine, facilitates NPP's evolving relationship with EsSalud-CAMEC, Trujillo. The National University in Trujillo (UNT) has provided laboratories and facilities to students working with NPP since 2011. The Missouri Botanical Garden (MOBOT) has funded key staff to work with NPP. Under the direction of Dr. Rainer Bussmann, the project has worked closely with MOBOT to collect, identify, and classify medicinal plants and specific remedies, as well as initial lab research and database development. The University at Buffalo (SUNY), through the work of Dr. Gail Willsky, provides students, instruction, and lab equipment to NPP. San Diego State University has hosted the MHIRT-Peru portion of the project since 2002. EsSalud has helped NPP implement research findings in their Center for Complementary Medicine (CAMEC) in Trujillo. Katelyn is a recent graduate of Linfield College in McMinnville, Oregon. She has a degree in Anthropology and Communications, and specializes in research and photojournalism. Katelyn was asked to work with NPP as its media specialist, photographer, and web designer. She traveled to Peru during the summer of 2014 to document the project and assist in research. Unless otherwise specified, all photography and web copy are her original work. For more information, please visit her website.